Porter Gulch Review is a literary journal out of Cabrillo College in Santa Cruz County. 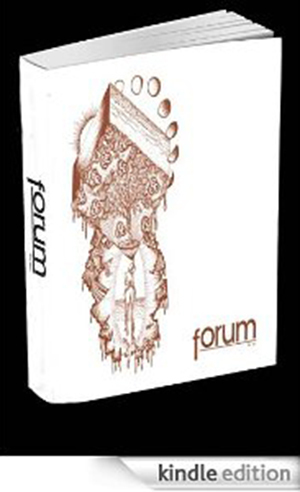 Like Forum and other college-based literary magazines it is assembled by students. It features poetry and fiction, drama, critiques/reviews interspersed with photographs and other forms of visual art. The magazine is mostly black and white. The design is very clean and modern with the authors’ names placed vertically near the margins of the pages; titles are in gray above standard black print. On some of the pages, writings share space and overlap with pictures Much of the visual art is very striking and compliments the written material very well. Much of the written material itself is also very good, covers a wide range of subjects and experiences as well as a range of styles and techniques. The poetry and fiction is followed by a series of critiques concerning selected submissions to the magazine as well as book reviews. Both sections are written by students in the class that produces PGR. The quality varies a bit in these two subsections though overall, the reviews and critiques are interesting. Overall Porter Gulch Review is a nicely put together, with a lot of quality fiction, poetry, photographs and artwork and is well worth a read. Issues back to 1999 are available as PDFs on Cabrillo College’s website. I grew up reading the stories of Raymond Carver. I have my mother to thank for the introduction and my own good sense to thank for aiding me in maintaining the relationship. I loved the “real life” subject matter and blue-collar characters of carver’s stories, stories that were set in places where such people would believably live, many times smaller towns and cities in the Pacific Northwest or sometimes ones local to my own native Northern California. Almost everything about Carver’s stories seemed somewhat familiar, like they could be about people you knew. I think that’s one reason why they were so hard to put down. The other was that the only thing you often had to reach for in the stories, or at least think about, was the stories meaning to you, which should probably be important to you when you like a story in the first place. Carver never tells you specifically what or how to feel about his stories and definitely never seems to try and lead the reader to any one conclusion or any such nonsense like that. The stories simply read like slices of people’s lives, just that the slices are carefully selected for the real events that occur in them, events which catalyze some change or revelation in or from the characters. It’s this style, which would later be dubbed by some as minimalism, which contributes to the common (at least for me) effect of the pause after finishing one of Carver’s stories, a lingering moment where you know that some profound connection has been made between your mind and the story because of the sincerity of the feeling you are experiencing, but you still must wait for the waves of the story to catch up and roll over you for a few moments while you try absorb or grasp just exactly what that revelation may be. I love that feeling. It is what really hooked me on Carver’s writing. You can imagine my alarm upon finding out that that feeling may have been caused just as much by the editing of someone else, as Carver’s own writing. Two new books out recently, Carol Sklenicka’s “Raymond Carver: A Writer’s Life”, and “Carver: Collected Stories”, a comprehensive anthology of Carver’s work from several different collections of stories, including his breakout collection, “What We Talk About When We Talk About Love”, but also including the unedited version of this book, which was originally titled “Beginners”, shed new light on the results of the influences upon Carver’s writing, channeled both indirectly through Carver himself, and much more overtly through Carver’s editor, Gordon Lish. By all accounts; in Sklenicka’s book as well as in the obviously apparent differences between the previously published “What We Talk About When We Talk About Love”, and the never before published original version, “Beginners” in the new collection, Carver’s editor Gordon Lish, certainly seems to be a heavy handed one. It may have been this way since the beginning. In 1972, Lish changed the title of the second of Carver’s stories to be published by Esquire (which he also profoundly edited the content of) from a more beckoning “Are These Actual Miles?” to much more benign “What Is It?” Carver, eager to be published in a major magazine, accepted the changes. He reassured himself and others by saying that “a major magazine publication was worth the compromise.” This however, may have been the establishment of Lish’s upper-handed power over Carver which would dictate the nature of their relationship for years to come. Was Gordon Lish a good editor? Well, he was at the very least, a successful one. Lish held the fiction editor position at Esquire magazine for 7 years, and then later a senior editor position at the publishing company Alfred A. Knopf for almost 30. Perhaps his success went to his head a bit and contributed to his tendency for taking liberties with the writing, and writers under his control. After all, Lish is the one who wrote a piece entitled “How I Got To Be a Big Shot Editor” and is said to have bragged that Carver was “his creature”. What appears on the back jacket of “Will You Please Be Quiet, Please?”(1976), Carver’s first published book of stories, is not Raymond Carver’s photograph but Gordon Lish’s name. Sklenicka’s own account of the changes in Carver’s third collection of stories, “What We Talk About When We Talk About Love” (1981), is nothing short of heartbreaking. There were, she says, three versions. The first version was the manuscript that Carver submitted. It was titled “So Much Water So Close to Home.” The second was the manuscript that Lish initially sent back. This is where he changed the name of the story “Beginners” to “What We Talk About When We Talk About Love,” and of course that became the new title of the book. Although this alarmed Carver, he still signed a legally binding contract with this version as the premise in 1980. Soon after however, a third version, and the version most readers now know, arrived on Carver’s desk. Now even the differences between the contracted version and this latest version “astounded” him. “He had urged Lish to take a pencil to the stories,” Sklenicka writes. “He had not expected . . . a meat cleaver.” According to the poet Tess Gallagher, Carver’s most recent wife, Lish refused over the phone to restore the earlier version and the rest is as they say, history. Only now, history is being re-written. The truths are finally surfacing, helped in no small way by these two very welcome books which are serving as long overdue correctives. One need only glance at the stories in “Beginners” and the ones in “What We Talk About When We Talk About Love” in the new “Collected Stories” to see the most obvious changes. The prose in “Beginners” consists of more concentrated blocks of narration interspersed with dialogue while in “What We Talk About,” much of both of these are simply…gone. In many cases, the man who is rumored not to have allowed editors to change his own work gutted Carver’s, and on this subject Sklenicka voices her own opinion in “A Writer’s Life” quite clearly, calling Lish’s editing of Carver “a usurpation.” He imposed his own style on Carver’s stories, and the so-called minimalism with which Carver is credited with, minimalism being a good thing or not, must have rested heavily and undeservedly on Carver. I for one hope that the weight upon him has lifted somewhat for his sake, rest his soul. Now all that is left, is for Carver fans to compare the different versions, edited and unedited, and make their own conclusions as this then becomes a very personal realm for Carver fans, and I being one of these, a place wherein I cannot and will not delve in print. As an active writer, I often look for new forums from which I can find fresh ideas and topics to explore. One can only produce so much writing from looking inward and conducting musings about their personal life, their state, their dreams. So I often find myself turning to literary magazines. Outside of books, they may be the most potent source of creative stimulation; they host numerous voices, varying so much in style and subject as to give a feeling of a bustling classroom workshop, where each page turned is a new table with another student reading their piece aloud to a small but hungry audience. At least, this is what the best magazines give to me. Ascent is one such magazine. Do not be put off by the fact that it exists solely online (it recently switched to an internet-only format, after 32 years as a print magazine). So much creative writing on the web seems to have been produced by well-intentioned would-be writers, who know only the most basic and clichéd styles of poetry or storytelling and who cannot for the life of them work a spell-check program. Two minutes on such sites would turn even the most easygoing reader into a grumpy stickler, who slaps his forehead in light of such horrendous displays of clumsy grammar and botched vocabulary. Like a breath of fresh morning air, the writings published by this magazine—mainly fiction, poetry, and essays—are polished and thoughtful. Though the stories certainly are as different and varied as in any quality magazine offering, a common thread among them is the clarity of vision and nuanced imagery of a novel. The poems are diverse enough so that if one seems too abstract or free-form for your taste, the next one will surely strike a different chord. The essays are the least predictable, the quality of the writing being much more erratic than the rest of the site. Yet even there they can pique your interest, reading like memories which blur at the edges but remain clear in all the important places. Ascent is not the Holy Grail of online journals. It isn’t revolutionizing the format, nor touting itself as the future of creative writing. Yet the standard of quality is high enough to warrant your attention. If you are at all interested in writing as an art-form, it is absolutely worth your time and effort to sift through the many stories and poems and assorted pieces. Inspiration, insight, and entertainment can all be found in its archives, as well as a chance to be published on its site. Submission to Ascent is an easy process, involving a single page fill-out of information. To any City College student who is attempting to be a poet or writer (and of course to any random person out there who writes, beginner or professional-grade), this is an excellent forum to seek out. We would like to announce a reading May 21 at Rosenberg Library to celebrate the unveiling of the Spring issue of Forum. All are invited, contributors are invited to read and receive a free copy of the magazine. There will also be an open mic for everyone else as well as refreshments. So come on down. About a year and a half ago, CCSF student April Martin Chartrand decided that she needed to leave a legacy. She had been sharing her poetry among friends and co-workers and getting positive responses, especially considering she’d essentially never taken an English class that wasn’t absolutely required for her B.A. in Creative Arts. And on top of that, she’s dyslexic. A self-described “perfectionist to a fault,” she decided to use all of her talents to complete a project that was 20 years in the making, using over 70 poems she had written over the years, and her own illustrations. The finished product was “Angel’s Destiny,” which was written in the style of a novel, the end of each chapter leading to a new step in a spiritual journey. The subject matter was born from an abusive marriage that Chartrand left in 1993. The poems that she wrote helped her own healing process and appeared on national television as well as radio. The four chapters of poetry, Illusions, Anger, Awareness, and Love helped her progress her journey of self-discovery and she hopes it will help the readers do the same. When it came time to publish her finished work, Chartrand took conventional steps and began sending out queries and manuscripts but in her mind she knew that she was going to self-publish, so she could maintain complete artistic control. “Poetry is the step-child of the publishing world and does not sell well unless you are a big name like Alice Walker or a newly selected poet laureate.” Not to mention that she included her original illustrations, clearly not the most obvious marketing decision from a new author. In the end, she chose to go it on her own and publish her book through www.createspace.com, a decision she has not regretted. Her legacy, her way. Switchback is a literary magazine published by the graduate students of the USF MFA program. Their website is well put together, my favorite being their links page which connects their readership with other literary magazines, affordable web design companies and literary venues. Definitely check out their links. They may prove very useful to you. The group publishes two issues per year in the fall and spring, coinciding with the school semester. Each issue has a theme and it is always something vs. something. For example, their last issue was titled Process vs. Product. Past issues include Stillness vs. Frenzy and Confession vs Mask. Only critical essays and artwork need to relate to the theme. If they publish your work you will be included in their contributor bio section. They take electronic submissions twice per year and accept outside submissions as well as from USF students and faculty. They require the genre and title in the subject line and the work as an attachment. Submitters may not include their name in the attachment in order to keep everything anonymous which I think appeals to those whose work is being judged. Artists, take note; they have a limited amount of artwork and are looking for more submissions so send in your best work. Just make sure it ties in to their theme for the issue. You will need to send an explanation on how your piece relates to the their theme. Each semester they throw a launch party to which everyone is welcome. The readings at these events are archived in in the magazine’s online video section and on You Tube. If you are not planning to submit to the magazine please at least check it out. It is a well made magazine and it is clear that much effort goes into selecting fine work. The selection of poetry pushes the boundaries and is often experimental in nature. The art reflects this aesthetic as well. I feel that many of the pieces will beg another reading and they certainly challenge the reader to think about what they’ve just read.